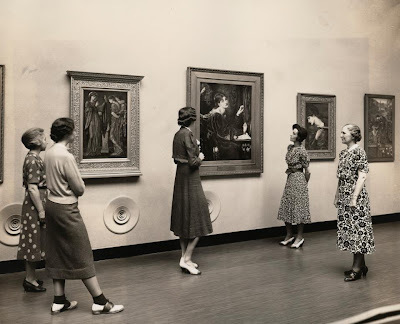 Pre Raphaelite Art: Museum staff in the Pre-Raphaelite gallery back in 1938. Museum staff in the Pre-Raphaelite gallery back in 1938. Very interesting! I saw them in Tate some years ago, but I loved them already. Thank you both. The Pre-Raphaelites were not in vogue at this time but glad to see someone still appreciated them. John Everet Millais - Leisure Hours. 1864.